Is the customer really “always right?” As much as this mantra has been force fed to us all our lives, the answer, of course, is no. There are many situations where the customer simply cannot have what they want. The product or service that they desire may no longer exist, or it may not be possible to deliver it in the desired time frame. Perhaps they’re not willing to pay for the product’s true value. Or there may be an organizational policy or rule that says it can’t be done. Regardless of the situation, however, Dale Carnegie Training tells us that the response of the customer service person should always be helpful, not negative. And as such, a simple “no” is not a good enough answer. Sounds simple in theory, right? But the fact is no matter what the situation is, good customer service comes down to meeting needs. The trick is figuring out how those needs could be met in ways different from what the customer was expecting. Consider this example: A customer walks into a store wanting to buy 100 widgets, but the store has only 25 in stock. Thus, the customer’s need, or want, cannot be fulfilled. But instead of flatly saying, “no,” the storeowner talks to the customer and discovers he only uses 10 widgets a week. Now the storeowner knows he can give his customer two weeks worth of widgets and still have few left over on the shelf. Plus, he can order a couple hundred more and have them in plenty of time before the customer runs out of his two-week supply. So, the storeowner turns to the customer and says “But what we can do…” and goes on to explain his plan of action. Isn’t that better than getting a terse “no”? Had the storeowner left it at that, the customer would’ve walked out and tried another store, and likely would have never returned. Instead, the storeowner probably secured a customer for life. That is what happens when someone says “no” to us. We react negatively. 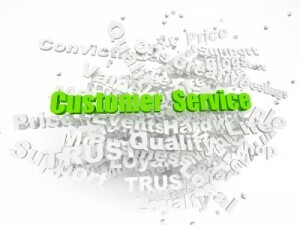 In a customer service situation where we want or expect something, we may even become upset or angry. Just think back to when you were a child and your parents told you no. It’s really the same feelings, just all grown up! If the “no” is followed or preceded by a “we can do this” statement, however, it can significantly reduce the negative impact. Customer service is about meeting needs and sometimes needs are different to wants.